In her role as president of the New Zealand Association of Philosophy Teachers, Libby Giles had the pleasure of participating in and presenting at the World Conference on Humanities. 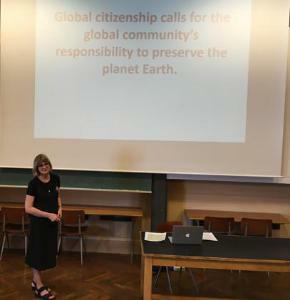 Her presentation was on a philosophical approach to embedding global citizenship education into all areas of school life, with responsibility as the underpinning principle. 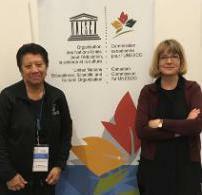 The conference was productive and busy, it had been two years in the planning between UNESCO and the International Council for Philosophy and Human Sciences (CIPSH). The event brought together scholars and research networks from around the world in the context of meeting difficult and demanding challenges. A desirable outcome would be the strengthening of the place of the humanities, given its ability to harness the diversity within societies. Learning to Live Together, one of UNESCO’s pillars of learning was the overarching theme of the conference. Innovative responses to the kind of transition the world is in requires a diversity of perspectives and disciplines. In education we hear time and again of the importance of STEM (Science, Technology, Engineering and Mathematics). Beyond scholarly work and research, the humanities must sure have its place in education at policy level, since the kinds of issues we face are fluid, not stable. This shift in thinking and practice enables the broad range of expertise and methods of understanding within the humanities to navigate the significant period of transition the world is in. In other words, the lessons to learn and positive ways forward in the areas outlined in themes one to five are advanced by the sixth theme, the humanities in a world in transition. A stand out feature within that theme was the place of philosophy in education and the number of presenters from a wide range of disciplines with a background in philosophy. It was clear to see more entry points and reasons for teaching philosophy in schools and its links to global citizenship education and education for sustainable development. Furthermore, clear links were made to overall well being with the usefulness of positive psychology on human flourishing.